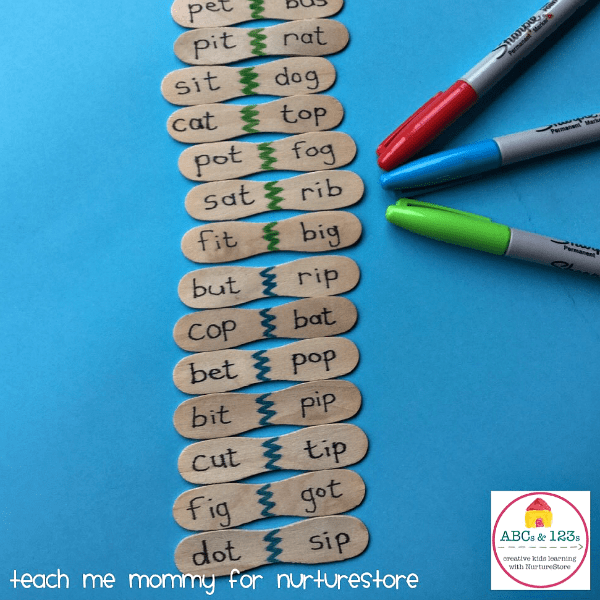 Nadia from Teach Me Mommy joins our ABC and 123s letter and math series today with a fun homemade word dominoes game that’s perfect to practice CVC words. 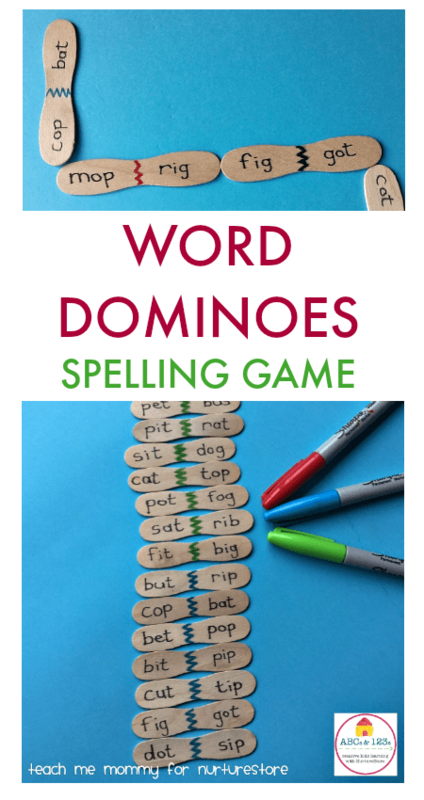 I am honored to be sharing this great CVC Dominoes game here today! What is so great about it, you may ask? 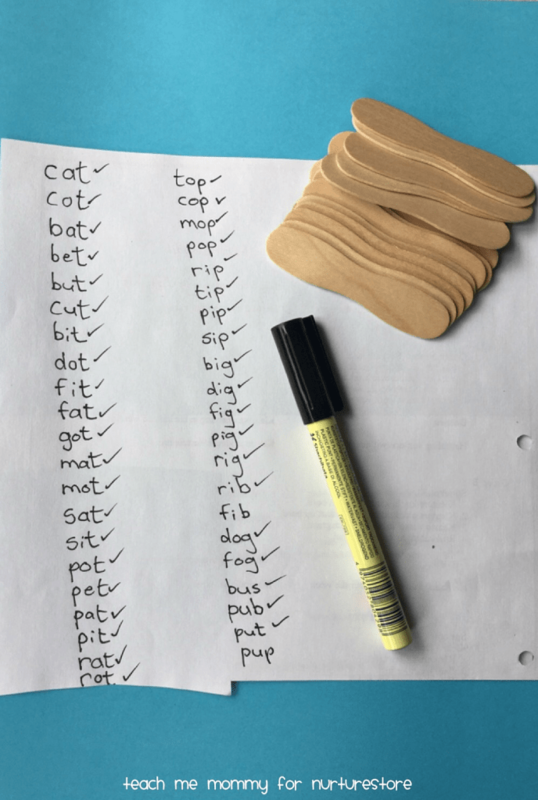 Well, it is not stunningly beautiful or impressive at first glance, but it is a do-it-yourself, frugal teaching tool you can use for revising CVC words. Oh, and because it is a game, it is usually a hit with everyone, even your reluctant reader! CVC words are short, single syllable words made up of a consonant – vowel – consonant pattern, like, c-a-t, d-o-g and m-a-t. They are some of the first word patterns beginner reader and spellers learn, and a great building block in knowing how to spell. I made these CVC dominoes for learners I see for literacy remedial lessons. 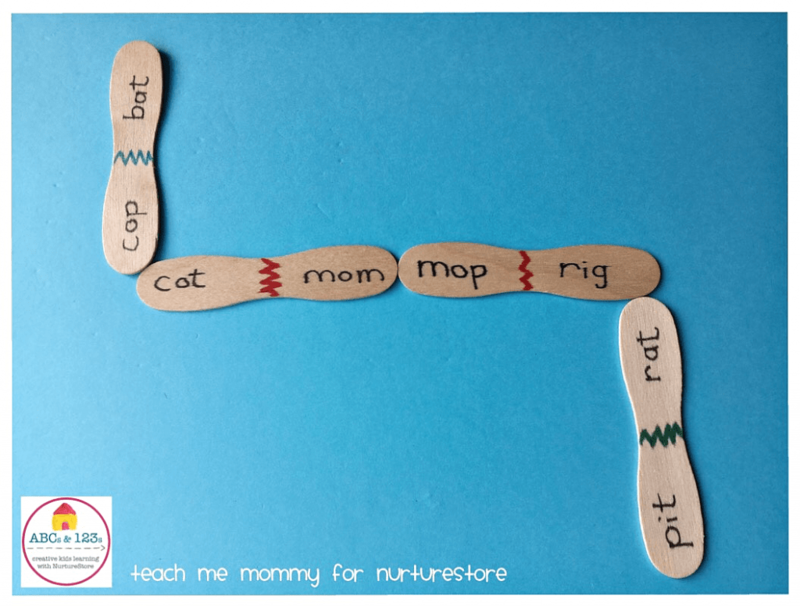 We have been working on 14 letters of the alphabet so far this year, and as a revision strategy I used those 14 letters to make up all the CVC words added to the sticks. Obviously you can add your own CVC words to your sticks, words your children are familiar with. The idea with this game is not to learn new words, but t0 reinforce what has been learned. Write the words on the sticks in random order. Decorate the sticks if you wish. I had forty words on twenty sticks. The more sticks, the better. You can either play with matching up beginning letters or you could match rhyming words (word families). As shown below, beginning letters: cop cot and mom mop etc. Or rhyming words: got cot and rig fig etc. Divide the sticks between the players. Then decide who will start, perhaps by calling: Who has the word mop? That player places the stick with the word mop in the middle of the table/carpet. Next player must now add a word that matches to the stick already on the table like in a game of dominoes. Carry on with taking turns matching. If a player cannot add a stick, he/she skips a turn. The winner will be the player who uses his/her sticks up first. Make a sentence with the word before putting it down. Think of more rhyming words. Use the sticks as a writing prompt: making sentences and writing them down. Make a silly poem with the sticks you have: The pot sleeps in the cot with a mot and got hot! A great game to revise CVC words, don’t you think? Nadia is a South African mommy of two and a remedial therapist. 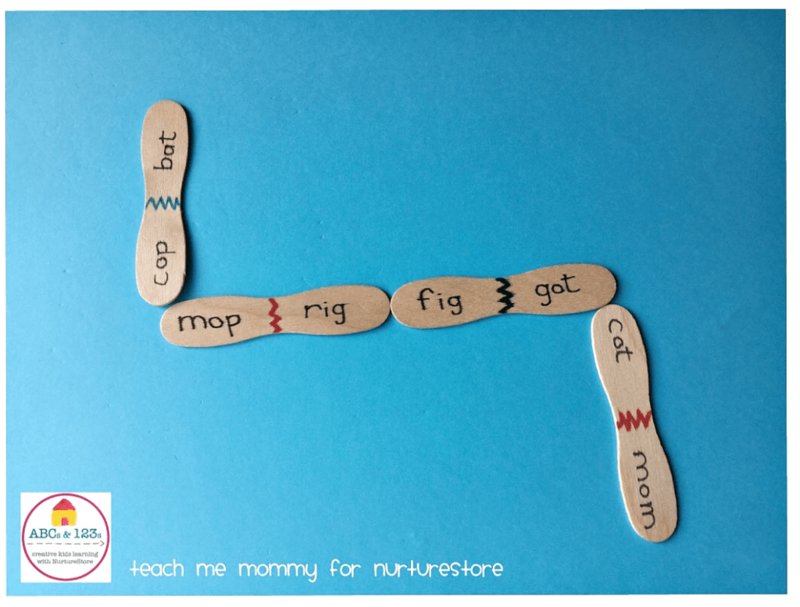 She blogs over at Teach me Mommy about easy and playful activities with the aim to teach. You can follow along on Facebook, Twitter, Pinterest and Instagram. This is awesome and not only will i use it throughout the year i will use it in various ways depending on readiness so I can see the extension ideas working at some point for the high achievers lol thanks for sharing this useful tool.